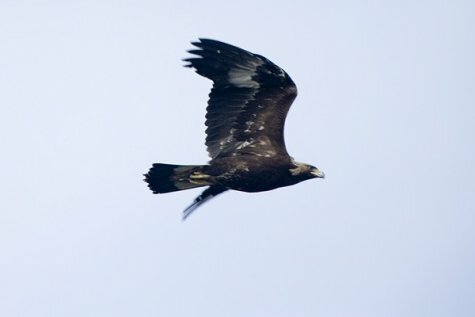 In addition to the white-tailed eagles sometimes golden eagles, with a slimmer body, can be seen in winter. Many white-tailed eagles and golden eagles spend the winter „at home“, in addition there are migrants arriving from east and north. The winter number in Estonia is estimated at to up to a few hundred individuals. On Arne’s photo we see a juvenile bird, with the typical white patches under the wings and the tail base. The image of adult birds in flight is dark altogether seen from below, although the basic colour of the plumage is brown. The crown and back of the neck of adult birds are golden brown, the forehead dark brown. The beak is black, the cere yellow. The wing span of the mighty bird is around two meters. For information: while the weight of a male bird may reach three and a half kilos then the female bird weighs up to some kilos more. A few times last year a juvenile golden eagle visited the same white-tailed eagle feeding ground, where the web camera is now.